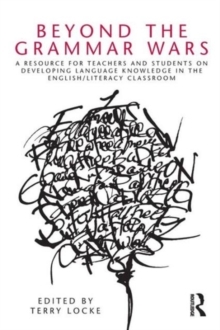 Are there evidence-based answers to the broad question "What explicit knowledge about language in teachers and/or students appears to enhance literacy development in some way"? Distinguished by its global perspective, its currency, and its comprehensiveness, Beyond the Grammar Wars:provides an historical overview of the debates around grammar and English/literacy teaching in four settings: the US, England, Scotland and Australiaoffers an up-to-date account of what the research is telling (and not telling) us about the effectiveness of certain kinds of grammar-based pedagogies in English/literacy classroomstakes readers into English/literacy classrooms through a range of examples of language/grammar-based pedagogies which have proven to be successful addresses metalinguistic issues related to changes in textual practices in a digital and multimodal age, and explores the challenges for educators who are committed to finding a "usable grammar" to contribute to teaching and learning in relation to these practices. All of the contributors are acknowledged experts in their field. Activities designed for use in language and literacy education courses actively engage students in reflecting on and applying the content in their own teaching contexts.